One of our favorite design solutions (especially this time of year when you have decorator’s whiplash) is our instant centerpiece. If you’re a frequent shopper, you’ve no doubt seen our selection of beautiful and versatile centerpiece trays, ranging from shiny metallics to rustic wood trugs. 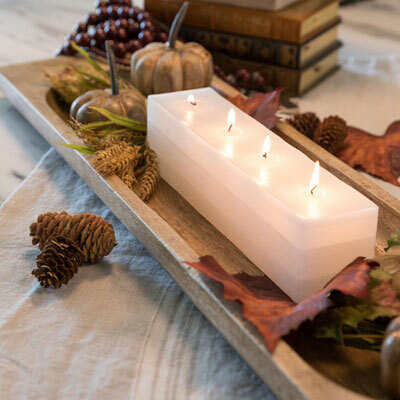 Start with one of these trays, select a large format candle or handful of colored glass votives, and add seasonal decor elements of your choice. Voila! It’s as easy as that…and the best part is that it can be used all year long and easily updated by swapping out a few elements. Fall Pumpkin Centerpiece: A perfect accent for the fall season with mango wood pumpkins, fall leaves, and golden wheat bunches nestled in our mango wood trug with a 3-wick brick candle. 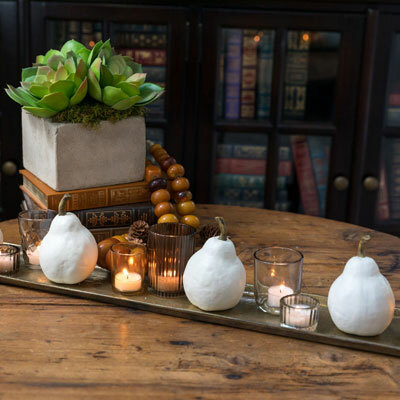 White Pear and Amber Votive Centerpiece: This sophisticated fall look starts with our gold aluminum tray, an assortment of amber votives, and white resin pears. 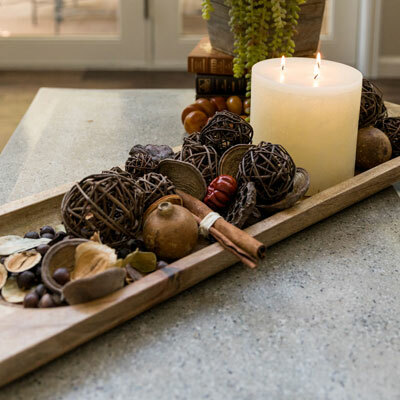 Telluride Centerpiece: Rustic redefined, this centerpiece incorporates our Telluride potpourri of fall botanicals with a warm, glowing drum candle to bring in the warmth and fragrance of the season. Let us help you make the holidays a little easier. Shop our centerpiece collection online or come in and let us show you how to pull your centerpiece together effortlessly and in no time! We’ll be sure to share our favorite winter and Christmas centerpiece updates in the coming weeks.